Is your house ready for a strong earthquake? Do self-check now. Manila, Philippines - How safe is your house in case of strong earthquake? To help owners of concrete hollow block (CHB) houses answer this question, the Department of Science and Technology (DOST) - Philippine Institute of Volcanology and Seismology (PHIVOLCS) in partnership with the Japan International Cooperation Agency (JICA), launched a 12-point questionnaire last February 2014 at the PHIVOLCS Auditorium in Quezon City. The questionnaire is designed to guide homeowners in assessing whether their homes are strong enough to withstand a major earthquake. The questionnaire, titled “How Safe is My House? Self-check for Earthquake Safety of CHB Houses in the Philippines”, has 12 questions, each with three possible answers. Each answer is equivalent to a point. The total number of points earned determines the strength or vulnerability of the structure. Among the questions in the checklist are: Who built or designed my house? How old is my house? What is the shape of my house? Has my house been extended or expanded? The rest deal with equally important information such as damage incurred from previous disasters, CHB thickness, soil condition, use of standard size steel bars, width of unsupported walls, among others. The initial result will verify wether your house was properly built and have followed appropriate construction procedures and recommended measures or if it will require necessary strengthening. “The solution is to recognize the problem. Where will this recognition start? 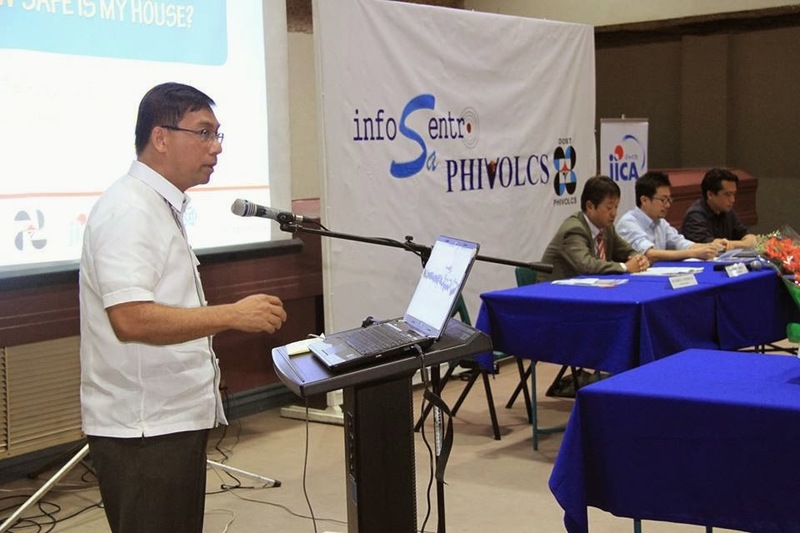 It should start with the homeowner,” emphasized PHIVOLCS Director Dr. Renato U. Solidum Jr. during the launch. Previously, Solidum explained that an earthquake resistant house will not collapse even if an Intensity 9 temblor strikes. However, the questionnaire is not just useful for homeowners but also for local engineers, building officials, and local government unit authorities. “This material can also be practically used to ensure safety before the construction of houses,” reminded Takahiro Sasaki, chief representative of JICA Philippines, in his message. The questionnaire, which was tested on some damaged houses and structures in Bohol following the Oct. 15, 2013 earthquake in the province, was derived from field verifications, quake damage surveys, and several experiments and tests. Among these experiments were the full-scale Shaking Table Test of CHB Houses conducted by Filipino and Japanese experts at the National Research Institute for Earth Science and Disaster Prevention in Tsukuba, Japan in February 2011. The experiment involved two houses, an engineered model that followed the Building Code, and a non-engineered one representing the more common CHB residence in the Philippines. Tests showed the latter incurring damage immediately , leading to the eventual collapse of certain parts during the earthquake simulation. “Casualties from past earthquakes were caused by the collapse of buildings. And part of those are from damaged to collapsed non-engineered houses,” revealed Solidum. During the open forum, Engr. Ronaldo S. Ison of the Association of Structural Engineers of the Philippines (ASEP), another project proponent, said that a strong earthquake may still cause debris to fall. However, an eventual collapse will not take place if it is an engineered house. ” What we’re trying to do is to educate everybody, that even if you employ masons and carpenters, they should be following certain standards. It is the right time for us to inform the public that we should not just rely on masons and carpenters to build our houses,” declared Engr. Ison. The PHIVOLCS director added that a safe house should be combined with appropriate response from people living in it to make them safer and further prevent damage and injury. PHIVOLCS and its partners are currently preparing a Tagalog version of the 12-point questionnaire and plan to come up with a similar checklist for wooden houses. Also in the pipeline is a computer simulation program to test the earthquake readiness of engineering and architectural designs. Aside from DOST-PHIVOLCS, JICA, and ASEP, the Japan Science and Technology Agency is also involved in the project. “How Safe is My House? 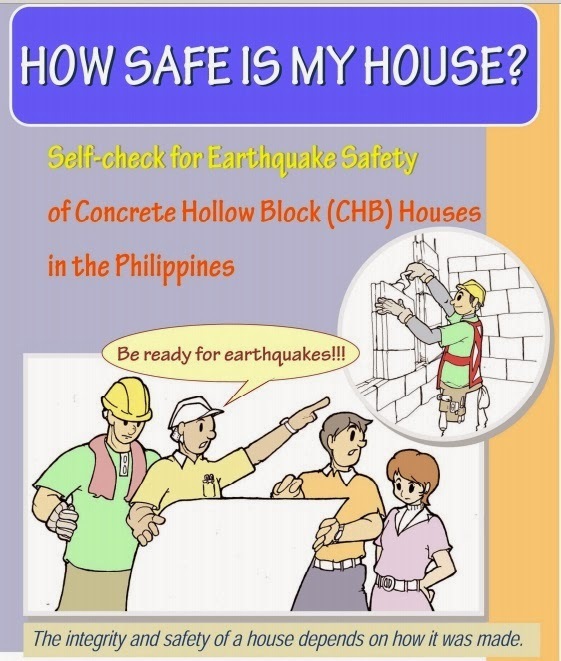 Self-check for Earthquake Safety of CHB Houses in the Philippines” may be downloaded here.